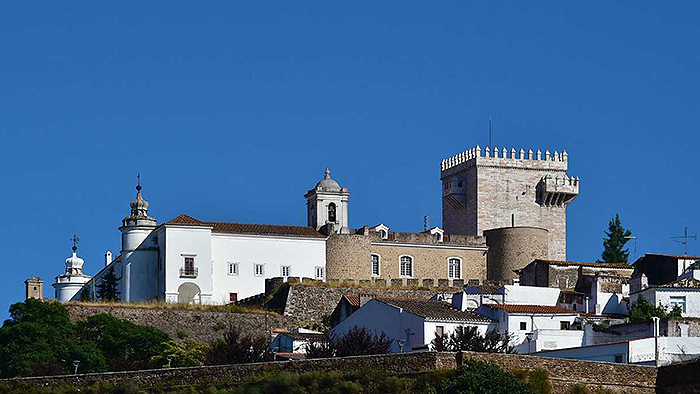 Located in the Alentejo region about 170 km east of Lisbon is the town of Estremoz. The region is known for its vast rolling hills, cork production, and marble quarries, and Estremoz is the largest of the marble towns that dot this region. Today the town is known for the charming clay figurines that are still handcrafted locally. You can shop for the figurines and other local earthenware pottery and cheeses at the Saturday market that is held in the Rossio Marquês de Pombal square. It is one of the largest markets in Portugal. There is also a Rural Museum that displays archaeological finds and a unique collection of painted clay figures from the 17th and 18th Centuries. The centerpiece of town is the 14th C. castle that was built by King Diniz for his beloved Queen, Saint Isabel. This royal palace has been converted into the Pousada Rainha Santa Isabel, which sits on a hilltop overlooking the town. For more information and reservations, click here. 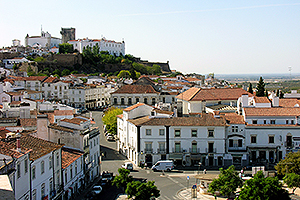 Located in the Alentejo region about 170 km east of Lisbon is the town of Estremoz. The region is known for its vast rolling hills, cork production, and marble quarries, and Estremoz is the largest of the marble towns that dot this region. The centerpiece of town is the 14th C. castle that was built by King Diniz for his beloved Queen, Saint Isabel. This royal palace has been converted into the Pousada Rainha Santa Isabel, which sits on a hilltop overlooking the town. There are a total of 33 rooms, consisting of 29 Standard rooms, 3 larger Superior rooms, and 1 spacious Suite with a living room and separate bedroom. All rooms are uniquely decorated, and many have four-poster beds and handmade local rugs.